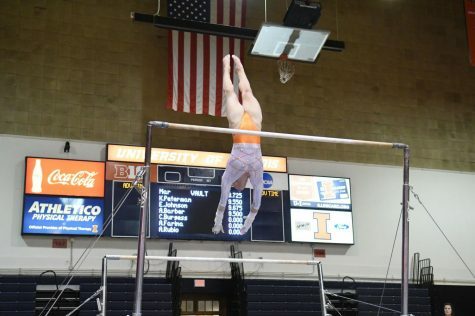 Rachel Borden was added to the Illinois women’s gymnastics team on Feb. 15 — one day before their meet against Iowa — where she made her debut on beam. 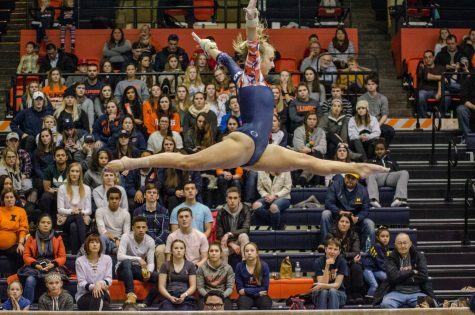 Having been the team’s manager for most of the past semester, the sophomore’s beam routine was able to capture the attention of Illini fans with over 48,000 views on Twitter. Borden’s story is best recognized as one of working even harder after hearing rejection the first time. She has been practicing with the club team since the end of her freshman year, coached by junior gymnast Rae Balthazor and past gymnast Sarah Lyons. After going home and working at her home gym, Borden contacted the gymnastics coaches about trying out for the team. However, with Borden needing work on her skills and an already large team of 18 gymnasts, she could not be added to the team. “She definitely showed a lot of potential. We liked her character, her heart and her work ethic … we had a little bit of a larger team already, and we were deep on the events that she trained,” said head coach Nadalie Walsh. At that point, the team needed a manager and Borden took the offer, wanting to stay in touch with the girls she met during tryouts. Their welcoming attitudes and Walsh’s advice on improvement gave her hope she could make the team. According to Borden, she needed to work on perfecting her posture, her skills and being consistent on hitting them. In particular, during tryouts when she would attempt a front aerial handspring, she would only make 2 out of 5 needed. Working with the club team throughout the fall semester, Borden attributes some of her success to the help of Balthazor and Lyons for getting her skills back in order to update Walsh on her skills. Given Borden’s improvements and “unforeseen injuries” from gymnasts on the beam lineup, Walsh decided it was best to add her to the roster sooner rather than later to bring depth back to the lineup. “I was honestly very impressed with what she was doing and so given our team circumstances, she seemed like she was our little blessing dropped in our lap to be able to come and help us immediately, and she’s done a great job,” Walsh said. With a repertoire of club experience, the most recent being a Junior Olympic qualifier and ranking third on beam at the 2017 Region 5 Championship, Borden showcased her routine at Iowa as an exhibition. Working out the nerves, she reminded herself of her teammates, their success and the advice they gave her and projected that into making her routine. 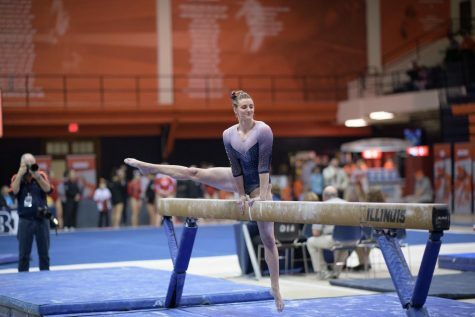 Borden scored a 9.700 and helped the Illini win their first away meet of the season by edging out Iowa 195.650-195.400. She was seen again at the Big Five meet on the lineup, scoring a 9.625. 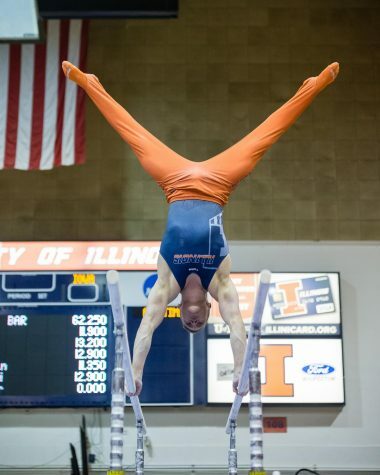 The Illini scored a season high of 49.075 in the event and finished third overall behind No. 8 Michigan and No. 14 Minnesota. They secured a spot on the night session of the Big Ten Championships on March 23. Borden hopes to clean up on her skills to help contribute to the team’s score. Walsh believes she will be a “valuable asset” to them.